It’s a long time since I’ve done one of these, but I thought the award was merited this week due to complete spin and utter disregard for the facts by one Johnathan Pile, from Crofton* in Yorkshire, who is the Chairman of the grandly titled ‘Yorkshire Against Hs2’ (of course, Yorkshire’s nothing of the sort. Ed). Pile has tweeted this load of fact free nonsense this morning. VTEC run from Wakefield Westgate, not Kirkgate and the cancelled train is run by Grand Central. 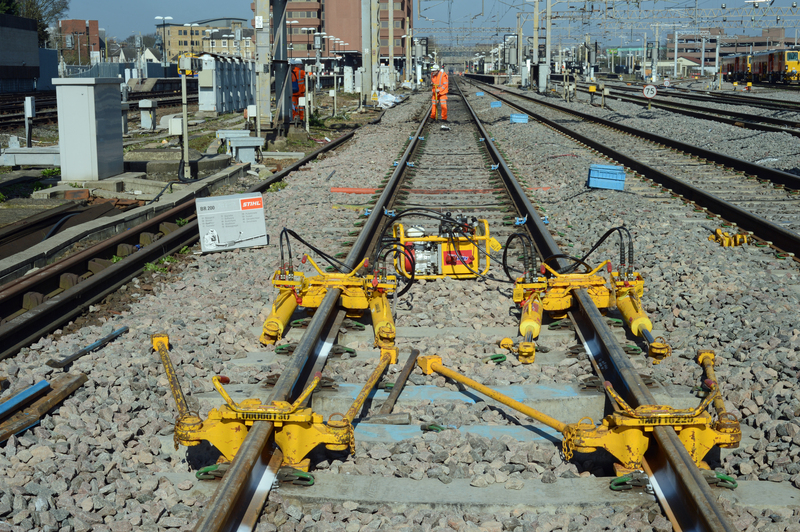 It was cancelled yesterday, but due to a technical issue with the trains traction equipment, not snow – as Grand Central tweeted. Grand Central arranged for their tickets to be accepted on an East Midlands Trains service from Leeds. This ran and arrived in London St Pancras, just across the road from Kings Cross (on time) at 18.26 several hours after the GC service which was scheduled to arrive at 15.07. Of course, there were other alternatives. The next Grand Central service did run. It left Kirkgate at 16.02 and arrived in Kings Cross at 18.32 (18 mins late). If Pile hadn’t already got a Grand Central specific ticket there was a VTEC service (the company he claimed was cancelling trains ‘cos of snow). leaving nearby Westgate at 13.18, giving him plenty of time to get a taxi across Wakefield to catch it. Here’s a copy of how VTEC’s services ran that day. None of the Kings Cross services were cancelled due to snow – or anything else – and timekeeping was pretty good. So, why did Pile have to drive? he didn’t, the 12.55 was the only London train cancelled, all others ran. It was a Sunday and his meeting (by his own admission) appears to have been today, so he had plenty of time to get to London. Of course, that wouldn’t have made a tenuous ‘let’s try and bash Hs2’ story! How long would it have taken him to drive yesterday anyway? Google maps calculates a journey made today would take between 3hr 43m – 4hr 6m to drive from Kirkgate to Kings Cross. As there was a lot of snow on the ground yesterday I’d suggest it would’ve taken longer and also been a pretty daft thing to do bearing in mind the weather conditions which were (allegedly) causing trains to be cancelled. But that’s Hs2 antis all over – a cavalier attitude to facts and the truth. It seems that according to people like Pile, facts are what you make up. Is it any wonder their campaign’s fallen apart? *Crofton is in the West Yorkshire constituency of Hemsworth. 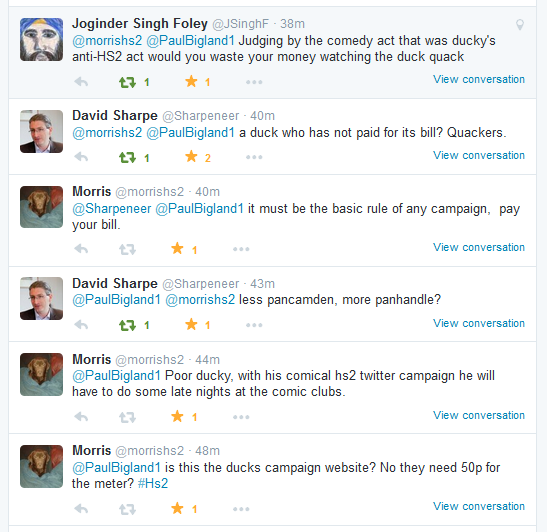 Despite Pile’s grand claims the anti Hs2 campaign isn’t exactly setting the constituency alight. I’ve had a look at the number of folk who’ve signed the latest Stop Hs2 Parliamentary petition. Here’s the result (updated today). Just 0.34% eh? Yorkshire ‘against’ Hs2? Even bleedin’ Hemsworth isn’t! Of course, Pile has form for making grand claims and writing cheques he can’t cash. A year ago he was threatening that he’d start a Judicial Review against Hs2 (link). It was nothing more than bluster. His group never even started to raise the money to pay for one. Crazy anti Hs2 campaigner of the week: No 19. I haven’t highlighted any individual campaigners for some months now as the whole StopHs2 campaign’s crazy nowadays but I couldn’t resist this outstanding example. So, step forward Nicholas Ward – who’s standing as a Stophs2 candidate in tomorrow’s Witney by-election! Witney is an ultra-safe Tory seat that was the constituency of David Cameron, the former Prime Minster, who held it with a majority of 25,155. Ward, who lives in Greatworth near Banbury has decided that this is the ideal place for him to persuade voters that Hs2 is such a major issue (even though it’ll go nowhere near the place) they’ll reject their Tory tendencies to elect him as their MP instead. There’s a grand total of 14 candidates standing in Witney which means Ward has to fight for votes against parties with far more credibility, like The Monster Raving Loony party, or bus pass Elvis! Mr Ward managed to get all of 92 votes. This beat his previous total of 63 votes from when he stood in Westminster North at the General election. It equates to 0.2% of all votes cast in Witney. Crazy anti Hs2 campaigner of the week No 18..
What happens when you click on the petition link?You get a petition that closed on the 7th August 2014 after gathering 124 signatures! The appropriately named Mr Batty appears to be a classic Walter Mitty personality as anyone browsing his details will find. He has a long history of preposterous personal claims. The anti Hs2 campaign does seem to attract an awful lot of people like him. Still, a man who can claim the anti Hs2 campaign is both “relentless” and “expanding” whilst posting rubbish like this obviously lives in a special place the rest of us don’t. Meanwhile, the active anti Hs2 flood petition has just passed the 1700 mark in 7 days. Anyone proficient in either maths or the way these polls work will know that means it doesn’t have a snowballs chance in hell of hitting the 100,000 in 6 months that it needs. I’ll do an update on this petition and the embarassment its providing for the StopHs2 campaign in a couple of weeks, when it’s clear it’s fading away. Although the week has only just begun I think it’s going to be hard to beat this lunacy from the Twitter account of the Mid Cheshire anti Hs2 group. Admittedly, they have a lot of form for spouting complete nonsense. After all, it was one of their members who claimed that the anti Hs2 campaign was bigger than the 1990s poll tax demonstrations (stop sniggering at the back!). I doubted they’d be able to top that but I have to say the anti Hs2 mob always seem to be able to exceed my expectations. Take a look at this.. So, there you have it. Don’t cure rail gridlock, don’t build a catalyst for massive regeneration in our major cities. Don’t create tens of thousands of jobs that will up-skill the workforce (who will then pay tax back to the government) – simply bung every ‘poor’ person in the UK £20,000 of taxpayers money, gratis – job done. Quite what they’d been ingesting when they came up with this stunning idea is open to conjecture…. With this level of intellect, grasp of economics and understanding of politics powering the anti Hs2 campaign, what could possibly go wrong? As the anti Hs2 campaign continues to implode and gets more desperate by the week it’s become harder to single out a single campaigner for the weekly award. Nowadays, crazy sums up their whole campaign. That changed today when Peter Jones, the obnoxious and libelous Camden campaigner came out with something so utterly crass and blinkered that it takes your breath away. Like many people, I’ve spent the past 12 hours watching with horror as the tragic events unfolded in Paris. This morning it became clear just how awful the scale of the terrorist attack had been. Along with people worldwide I was moved to show solidarity with Paris and the people caught up by displaying a symbol drawn up by a young man who then shared it on social media. That symbol has since gone viral. You can read about it here – although I’m sure many of you will have already seen it. To cement his title to the crown, Jones has added ambulance-chasing to his list of odious accomplishments. To compound French woes there has been a rail accident today. 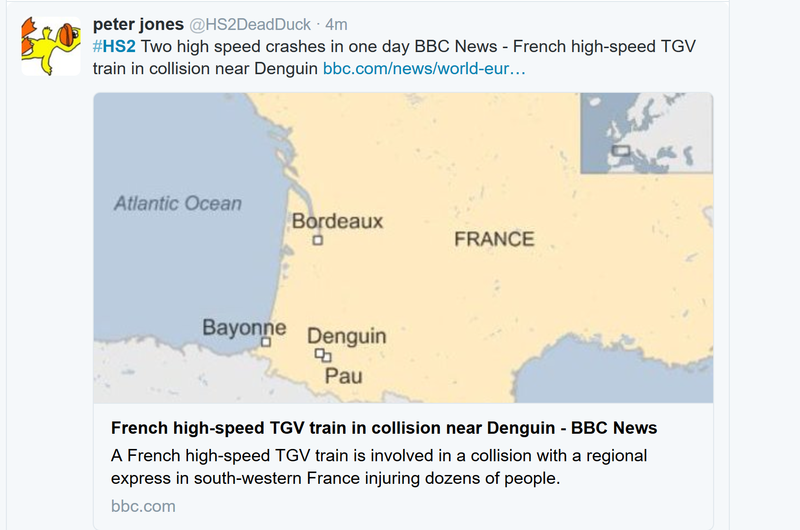 A high-speed test train has derailed on a yet to be opened TGV line, killing five of the technicians aboard. 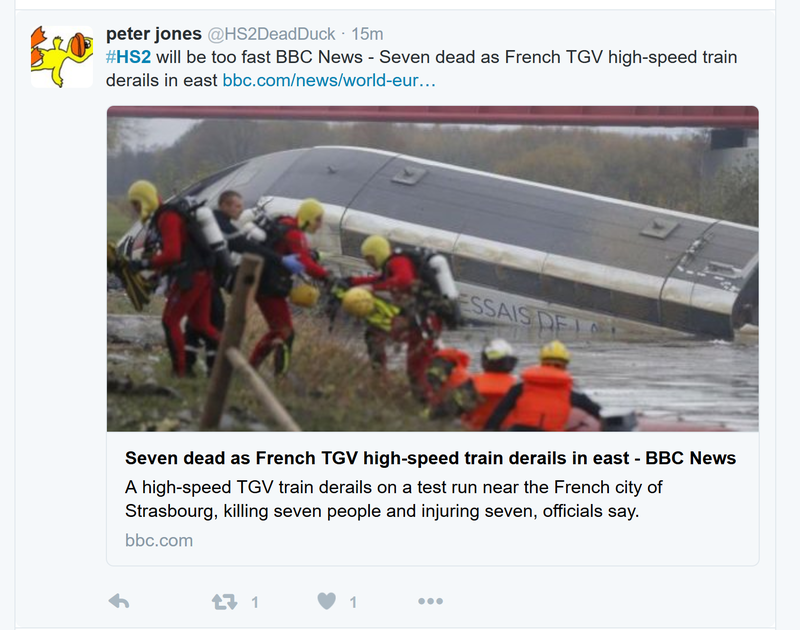 Jones triumphantly & sickly uses this incident in a crude attempt to scaremonger & smear high speed rail in general & Hs2 in particular, then pretends a 2014 incident in which a TER service hit a TGV was a second accident today! Note there’s not a single drop of sympathy anywhere for the dead and injured, or their families, just triumphalism. Jones and his fellow travellers in the anti Hs2 campaign are beneath contempt. Here’s proof (where any more needed) from this evening that Jones is a brass-necked hypocrite of the first water who has the cheek to accuse me of exploiting tragedy! Crazy anti H2 campaigner of the week: No 12. 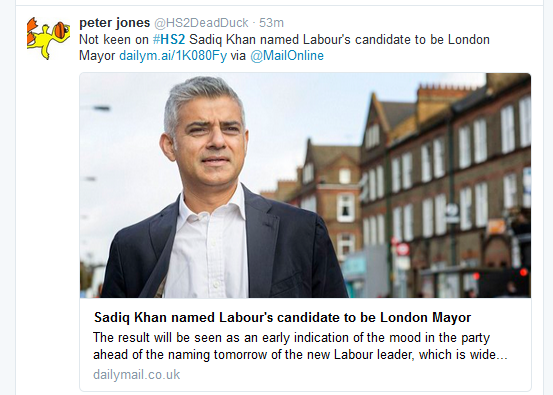 Even more crazy than his usual claims was this one claiming Sadiq Khan, the newly anointed Labour Candidate for London Mayor, somehow opposes Hs2. Once again, Twitter soon exposed his rubbish with one person digging out one of Khan’s own tweets! Khan also voted FOR the Hs2 Hybrid Bill in April 2014. Now he’s a Mayoral hopeful Khan may try & play both sides until after the London election (like Boris Johnson has in the past) but one thing’s clear. He won’t volte-face to oppose a scheme that offers so much to London and the Labour heartlands in the North. For some reason the anti Hs2 campaign has always attracted the Walter Mitty types & this weeks chosen campaigner is a classic example! Today’s superbly daft tweet sets the scene. ‘Relentless & expanding rapidly’? How deluded can you get? I’ve blogged before on the true situation with their campaign but let’s have a look at the state of play since I wrote that back in January. In the past 6 months the anti campaign’s failed to make any impact on a general election. Unlike previous years it’s not organised a single national event, demonstration or gathering- nor has it any planned. It’s failed to capture much media attention and its social media penetration is poor (to say the least). Here’s the latest ‘scores on the doors’ to illustrate the fact. The usual caveats apply. Not all followers are supporters etc. The figures show that not only is the anti campaign growing slowly from a ridiculously small base, in some cases it’s going backwards! To put these figures in perspective, over 46 million people are registered to vote in the UK! So much for ‘expanding rapidly’ eh? 2015 has shown that the anti Hs2 campaign only really exists on social media nowadays. 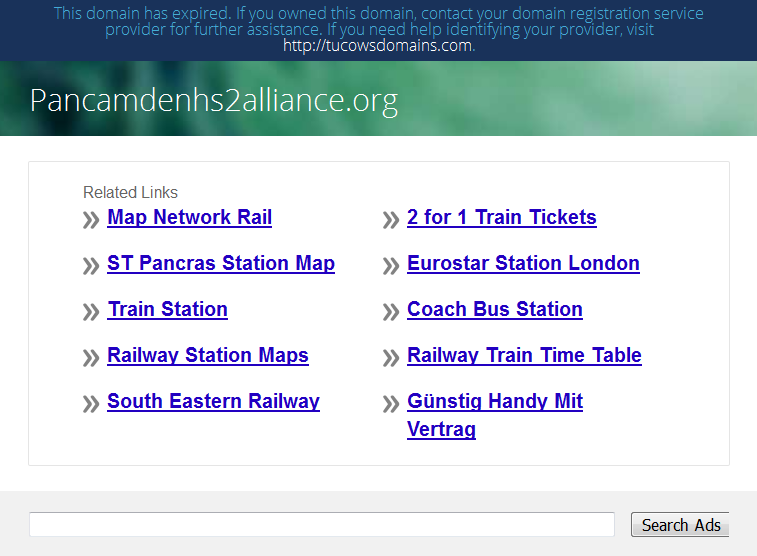 The ‘action group’ network that Hs2aa used to boast about (claiming over 90 +) has been shown to be less than half that. No new groups have formed since Phase 2 was announced but plenty have folded. The anti campaign was further embarrassed when the Mid Cheshire ‘action’ group published their 2015 AGM minutes online. These exposed the fact only 23 people attended out of a Cheshire population of 700-800,000! Unsurprisingly, the group has since taken the minutes off the web. No doubt the ‘action’ group network will dwindle further one the petitioning process is completed. After all – what are they for anymore when there’s nothing going on? So, where’s any evidence (outside of his own fevered imagination) to back up Batty’s claims? There’s none. Anywhere. 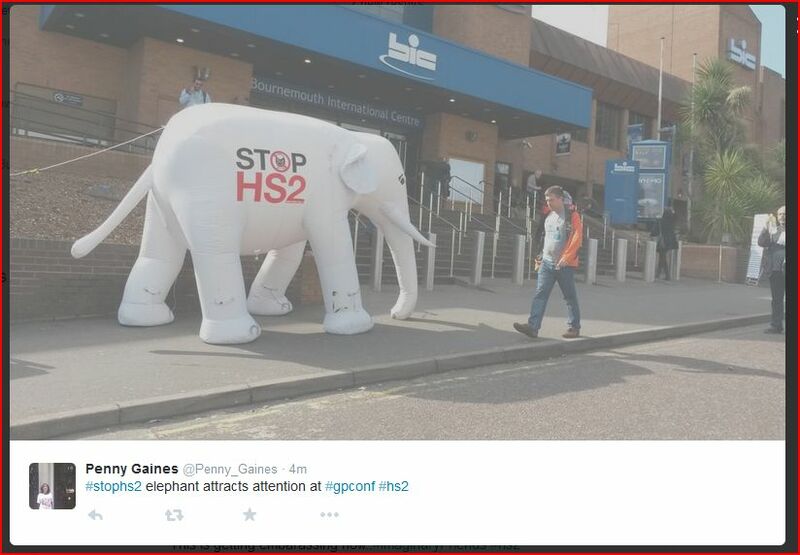 You’ve got to hand it to the anti Hs2 campaign, they really do know how to attract some very ‘special’ people.